Summary: The screech of tires brought Hannah Scott’s world as she knew it to a devastating end. A year after she signed the papers to donate her daughter’s organs, Hannah is still reeling with grief when she unexpectedly stumbles into the life of the Bell family, whose fifteen-year-old daughter, Maddie, survived only because Hannah’s daughter had died. Mesmerized by this fragile connection to her own daughter and afraid to reveal who she actually is, Hannah develops a surprising friendship with Maddie’s mother, Olivia. 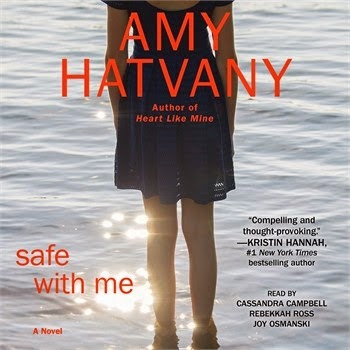 I actually listened to SAFE WITH ME by Amy Hatvany a long time ago and forgot to write a review. I probably shouldn't admit that to you, but I think what's important here is that I still remember enough details about this novel to sit down a few months later and write my thoughts. As far as I'm concerned, that's a sign of a powerful story. At its simplest, SAFE WITH ME is a story about women, friendship, and other relevant issues. Hannah Scott is a young mother who lost her daughter in an accident about a year ago. She decided to donate her organs to help others, but she's still unable to handle the grief (and guilt) of losing her only child. And then she meets the Bell family. Hannah immediately develops a friendship with Olivia, a woman who seemingly has it all, and her 15 year old daughter Maddie. Olivia is beautiful and financially secure; however, it's apparent that she has some dark secrets concerning her marriage. Maddie also has some problems with her father, her constant struggle with her health, and her re-entry into the real world of high school. As Hannah becomes closer to the Bells, she begins to realize that Maddie is alive because of her daughter. She suspects that Maddie's organ transplant was actually her daughter's liver, yet she's not willing to share her thoughts with either Olivia or Maddie. All three of these women are dealing with some very serious issues, and they try to handle them in the best way they can... which, of course, isn't always the ideal way. Despite keeping secrets from each other, they discover the importance of friendship and safety. I thought SAFE WITH ME was a very good book, but I've come to expect that from Ms. Hatvany. I always seem to enjoy her novels which explore female relationships and give insight into some complicated (and relevant) issues. I especially appreciate her character development, and I like how she manages to create some very real characters that also manage to capture my heart. Ms. Hatvany is not afraid to take on some complicated and controversial issues in her books -- that's for sure. This novel actually did take on quite a bit... organ donation, social media, loss of a child, and domestic abuse to name a few, and I admit that I was concerned that it might be too much for one book. However, I can now say that the author did handle all of these issues in a compassionate and fair manner. I was impressed that she could pull it off! One thing in particular that I appreciated about this novel was the recurring theme of safety. She did a marvelous job of exploring this theme through many of the characters' actions and motivations. For example, Hannah was distraught with grief for not being able to keep her young daughter safe; and Olivia was dealing with trying to protect her daughter, and at the same time, deal with an abusive husband. Maddie was attempting to reconnect with society not only at school but also through social media -- which as you know has its own share of risk for teens. I really liked how all of these women's stories tied together and had the idea of safety/security running through them. The audio version of SAFE WITH ME was read by Joy Osmanski, Cassandra Campbell and Rebekkah Ross. I thought it was very, very good. Since the story was written with through the three main characters' viewpoints, the audio book alternated between these three narrators. I thought they did an outstanding job... enough so that I would search out other audio books that they've written. SAFE WITH ME would make a wonderful book club selection especially for groups made up of women! Not only is it a touching story that is also very readable, but there are many things to discuss. There is a reading guide with eleven questions as well as a few ideas for ways to enhance your book club. Some of the themes you might want to discuss include friendship, grief, loss, secrets, marriage, domestic abuse, technology, death, illness, organ donation, and parenting. Overall, despite the predictable ending, I really enjoyed SAFE WITH ME. Recommended for fans of women's fiction. Can you believe I've never read Hatvany. I need to rectify that because I love authors who aren't afraid to take on issues. This sounds outstanding. I was about to pass on this one...until I read your review! Sounds like a good one! Wow. This sounds really good. I don't think I've ever read Hatvany. I love that group of narrators, so I'd likely give the audio a try.